Spain > Galicia > Rias Baixas > Bodegas Valdemor "Namorio"
Valdamor's vineyards, overlooking the Atlantic. Albarino (Alvarinho) is a green-skinned grape variety native to Galicia on the north Atlantic coast of Spain, and makes up some 90% of all vineyard plantings in the Rias Baixas, where it makes plump white wines with peach, citrus and mineral characters that pair perfectly with the local seafood. The variety is high in acidity, and can be produced as a light white wine or in a fuller style, with oak or lees aging adding to the texture and richness. The slight salinity imparted by the nearby Atlantic ocean makes Albarino from this region a perfect food wine. The variety is often made into a lightly sparkling Vinho Verde wine across the border in Portugal, which is commonly labeled varietally (as Alvarinho) to distinguish it from the usual Louriero-based Vinho Verde blend. Rías Baixas is located in North West Spain, just above Portugal, in the region of Galicia. The DO was founded in 1988 and it is the most important DO in Galicia and the only white wine only DO in Spain. There are 8,650 acres under vines, over 6,500 growers and 20,000 individual plots with 198 wineries, up from 60 only in 1990. Albariño covers 90% of the crop. The vast majority of growers bring their fruit to the regions co-ops, with estate-bottled wines being a relative rarity in the area. Because of the region’s rainfall and humidity, most vines are trained on the "parra" trellis system, invented by the Romans in the 2nd century AD to promote air circulation and prevent fungal infection. Bodegas Valdamor, a family winery founded in 1990 just after the creation of the DO, works exclusively with the Albarino grape. The vineyards are located within the sub-region of Val do Salnés; the original and oldest sub-zone in the Lower Rais. The Soil is granitic and rocky with alluvial top-soil. Due to its proximity to the Atlantic, it is also the coolest and wettest sub-zone with an average temperature of 55 degrees F creating a very long, slow ripening season. The philosophy of Valdamor winery is based on trying to integrate the traditional work in the vineyard while using modern techniques for the vinification process, this to capture the authentic character of the Albariño grape. 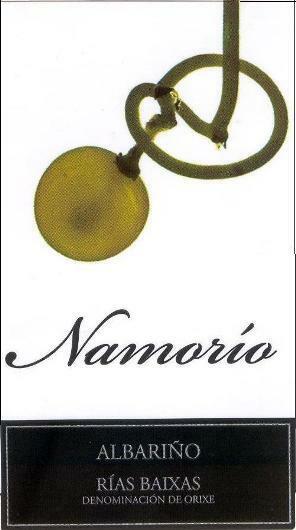 Namorío is one of Valdamor's best examples of Albariño. Namorio Albarino: Cold-macerated and then cold-fermented in stainless steel to maintain its vibrant primary fruit, filled with floral notes and the brightness of a fresh peach.